Robotic arms are critical equipment for assembly, welding, and other automated manufacturing processes. In the event of a catastrophic power failure, it’s important that robotic arm movement be captured and stopped to prevent mechanical collapse and equipment damage. To that end, Miki Pulley manufactures a wide range of motion control solutions for robotic arms, including shaft brakes, clutches, and couplings. 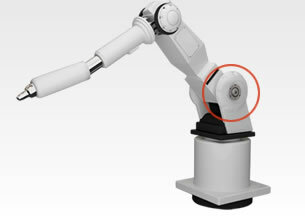 In the example above, a Miki Pulley BXR safety brake serves as both a holding brake and a “power off” emergency brake for a robotic arm. 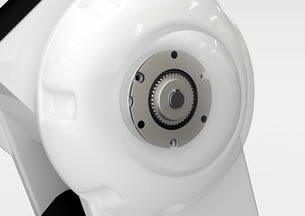 Designed with a thin profile (roughly 2/3 the thickness of some of our other brake units), the BXR saves space in the robot’s articulating joint housing. The BXR’s lightweight construction significantly reduces idling wear. BXR shaft brakes feature low-inertia rotors that dramatically reduce both mass and drag wear while providing more than adequate strength. With minimal backlash at starts and stops, precise positioning can be maintained across all functions. The unique energy-saving design reduces coil temperature during operation. BXR brake units can be installed on servo motors without inhibiting responsiveness. Request a quote on shaft brakes, clutches, couplings, or other motion control solutions for your robotic arm applications. Or, contact Miki Pulley for more information.